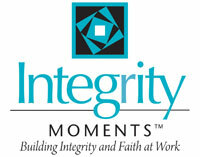 Integrity Moments is a daily sixty-second radio program featuring hard-hitting biblical truth applied to practical workplace stories. Integrity Moments is hosted by author and business innovator Rick Boxx who has authored several books and bible studies, including "How To Prosper in Business. Without Sacrificing Integrity." Rick Boxx is the President and Founder of Integrity Resource Center, a nonprofit organization dedicated to building integrity and faith into the workplace. His vast experience in banking, public accounting, consulting and as an entrepreneur, combined with his extensive knowledge of practically applying God's Word to the workplace, has equipped him to serve thousands of business leaders. Rick's "Integrity Moments" daily radio vignettes and broadcast emails are widely read globally and appreciated for their brief but hard-hitting biblical truth applied to practical workplace stories. He's the author of several books and bible studies, including "How To Prosper in Business Without Sacrificing Integrity." Rick has been married to his lively and lovely wife Kathy for over 25 years. They both are most grateful for their great kids, Megan, Jeremy, and Rebekah. After submitting your info above, you will immediately be prompted to download the radio programs for INTEGRITY MOMENTS.